In the 1950s, canasta (Spanish word meaning basket) hit the U.S. by storm. Typically, the game is played with four people who form two teams. Another common version is for two to three people to play individually rather than on teams. There are also variations of six players in two teams of three. It takes two standard card decks to play for the first version mentioned and the jokers are included. The goal is to make melds of seven cards of the same rank (a canasta), and get rid of all the cards in the hand. A player cannot go out in the game unless the partnership has melded at least one canasta. The object of the game is to score points, and the game ends when one partnership has accumulated a minimum of 5000 points at the end of a hand. If both have 5000, the one with the highest point total wins. After bonus points are counted, the value of the cards themselves is added to the total. The team that did not go out must subtract the value of cards they hold in their hand from their total. Note: To go out concealed, a player cannot have melded or added to a meld made by their partner. The only card that can be showing on the table for them would be red 3s, which must be laid down immediately when they are dealt or drawn. After shuffling, each player is dealt 11 cards and the rest of the deck is placed face down for a draw pile. The card on top is revealed and serves as the start of the discard pile. If the initial revealed card is a three or a wild card (deuces and jacks), another card must be pulled from the draw pile and placed on top of it. The red three or wild card is turned at an angle to indicate the pile is frozen. A frozen discard pile can only be picked up by a player if they can use the top card in a meld containing two natural cards from their hand of the same rank. The player at the left of the dealer takes the first turn. They can meld cards if desired by laying down three of a kind or any combination of natural cards and wild cards that form at least three of a kind. It the player has no cards to meld, they cannot draw from the discard pile until a meld is made. Without a meld, the only choice is to draw from the deck, and then place one discard in the pile. 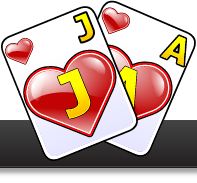 Depending on the game version being used, players may draw two cards from the deck and discard one. In some game variations, the 2-card draw rule is not used. If the card drawn from the deck is a red 3, it is placed in the melding area and another card is drawn; this rule does not apply to the discard pile in that no additional card is drawn if a red 3 exists in the discard pile upon pickup. Once one member of the team has placed a meld on the table, both are free to draw from the discard pile as long as the top card of the pile is playable immediately in a meld. After a player takes the top card and makes a meld, the remaining cards in the discard are taken and other melds may be made from those cards during the same turn. After taking the pile, the player must place one discard there facing up. Melds are kept on the table in front of one of the partners, not by both. A player can add to a partner's meld during a turn. It is only necessary to have one card in the same rank to add to a meld. Red 3s must be placed on the table face up in the partnership area immediately. If a player is dealt one or more red 3s in the initial deal, they draw replacement cards from the deck to total 11 cards to begin the game. Black 3s are not played in a meld unless it is necessary for the player to go out at the end of the game, and then 3-4 black 3s can be melded in the going out process; no wilds can be melded with black 3s. A black 3 can freeze the discard pile for the next player when placed on the pile. A meld cannot contain more wild cards than natural ones, and it must contain at a minimum two natural cards. Suit does not matter except in the instance of red versus black 3s. Wild cards cannot be used with 3s nor can they be melded by themselves. For instance, two 8's and a deuce is a legal meld (8-8-2); 3 Kings and 3 wild cards is a legal meld (K-K-K-Joker-Joker-2); 2 Queens and 3 wild cards is NOT a legal meld (Q-Q-2-2-2). There are many different games and variations of canasta. There is original canasta, U.S. American canasta, Samba, and several national versions of the game including Chilean, Cuban, Brazilian, and Italian. There is also "boat" and "hand and foot" canasta. Be sure when choosing a variation for play that everyone participating is made of aware of the rules for the particular version chosen.